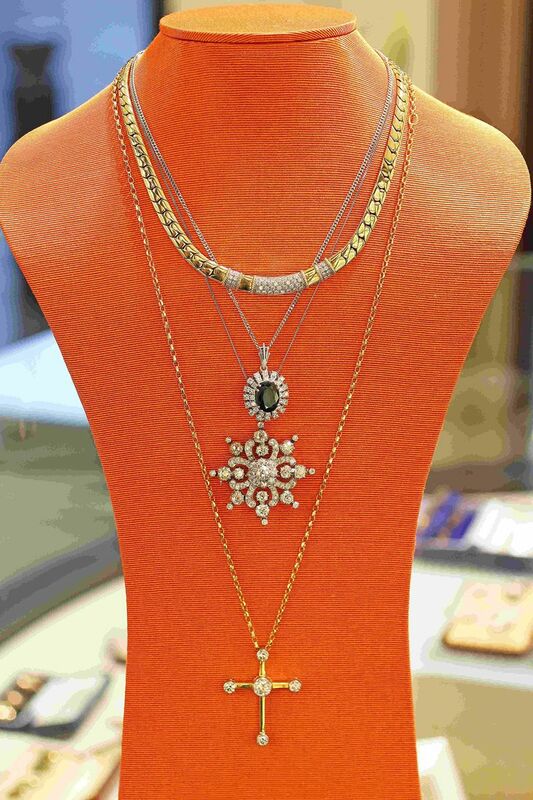 With so many different styles of necklace on the market, it can sometimes seem impossible to pick the right one. There are so many different factors to consider; especially when it is a fine piece such of ours that you want to get maximum wear out of. Fear not! I am here to help you decide which length and style will best suit you. 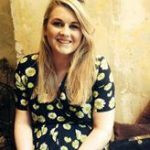 So Many Lengths – Which Should I Choose? With so many different length chains available, it is hard to know which one is best for you. The best way to narrow this down is to measure the circumference of your neck using a soft tape measure. It is typical to add two inches to this number for a non-restrictive choker. Choker: A 16 inch necklace is referred to as a choker. These are usually a simple style, such as a pearl strand. Princess: 18 inches is referred to as a princess necklace, which will sit on the clavicle (collar bone). 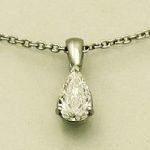 Solitaire pendants look best at this length. Matinée: Necklaces between 20 and 22 inches are classes as Matinée, and sit just below the clavicle. This length is best for pendants and lockets, as they will sit just above the neckline of a top. Opera: Opera necklaces are most commonly pearl strands and sit at the middle of the bust. They are typically 24 inch chains. Rope or Lariat: Past the 24 inch mark, a necklace is classed as either a lariat or rope type. A rope necklace is a lariat that does not have a clasp. So now we have established the different lengths available, we should look at the factors which can affect your decision. Your Height – Whilst most lengths will suit any height, if you are under 5’4” then you should stick to 20 inches and under. This length is perfect for elongating your frame. It is often said that women over 5’7” should avoid chokers, however as an avid wearer of such pieces I disagree. Body Type – A necklace can be used to draw attention to a particular part of your frame. 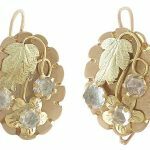 For apple or pear body shapes, a necklace that sits higher than the breast line is ideal as it draws attention to the smallest part of your body. If you have a flatter chest then a longer and thinner necklace is ideal for elongating this section. These factors considered, it is also important to note that different necklines will suit different types of necklaces. Here’s our style guide of how to get the perfect ensemble. Stick with shorter necklaces when it comes to polo / turtle necks. Ideally they will sit just below the clavicle and be rounded in design to fit with the shape of the neckline. 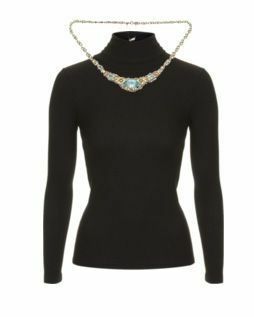 This aquamarine and diamond collarette goes perfectly with this Topshop polo neck. Unsurprisingly, v-shaped pendants go perfectly with V-neck t-shirts. Keep the length above the neckline in order to showcase it fully. 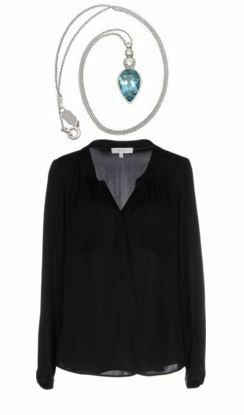 This gorgeous opal and diamond pendant adds the right amount colour and luxe to a plain black tee like this H&M one. 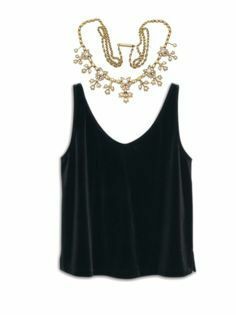 Round neck vest tops and t-shirts are best complimented by shorter necklaces of a similar shape. 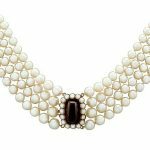 This Victorian seed pearl necklace is perfect both day and night when teamed with this Mango vest. 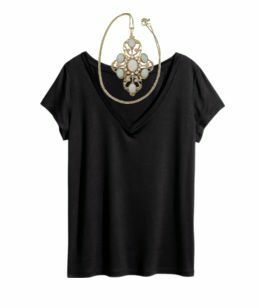 Open shirts / blouses are the perfect opportunity to showcase a short pendant as the shape will fit perfectly with the neckline. 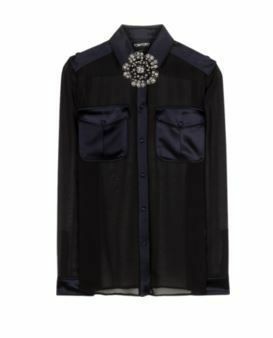 Team this YOOX shirt with our gorgeous aquamarine and diamond pendant for a winning combination. Crew neck jumpers (like this Oasis one) and tops are my go to in winter but can sometimes feel a little boring. A strand of pearls is a great way to jazz them up – make them extra special by choosing one with a diamond clasp like ours. 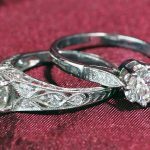 Now I know this blog was meant to be about necklaces but I felt like I had to include this one at the end. Brooches have made a comeback in recent years and can double up as a necklace. This Victorian diamond brooch is a great addition to this buttoned up Tom Ford shirt. I hope this guide helps you when wondering choosing the right necklace length. Which is your favourite from our inventory? Let me know in the comments below!